Pets are given up for a number of reasons: financial concerns, illness, moving to a home that doesn’t welcome pets, allergies, pet behavior issues, and unwanted litters, just to name a few. The Michigan Humane Society offers many resources to help keep animals in loving homes. MHS urges pet owners to consider other options before surrendering their animal. We understand that there are times when keeping a pet is just not possible. Please review the following information for our surrender policy and process. Check with relatives or friends who may be willing and able to provide your pet with a loving home. Finding a pet friendly apartment may take a little more effort, but today there are many more rental options for people with pets. Try visiting one of many websites tailored to the needs of pet owners, such as rent.com, peoplewithpets.com or ApartmentList.com. Such websites save you time and effort by allowing you to search for apartments in various communities, in your target price range, that can accommodate your companion animal. Pet owners are required to schedule an appointment to surrender their pets. There is a $50 fee due at time of appointment. Mon. – Sat., 9 a.m. – 5 p.m. and Wed., 9 a.m. – 6 p.m.
Due to federal regulations we are unable to accept any medications for any reason. All customers are asked to arrive 10-15 minutes prior to your scheduled appointment time. Placement: The Michigan Humane Society makes every effort to place healthy, friendly animals in new, loving homes. However, we cannot guarantee rehoming of your pet. The placement of an individual animal for adoption is based on an evaluation of his or her health and temperament. Once an animal is placed up for adoption at the Michigan Humane Society, there is no time limit in which he or she can remain up for adoption. Rehoming Your Pet: Before surrendering a pet to a shelter, MHS recommends first trying to find a suitable home for your pet by spreading the word among friends, relatives and co-workers. Give yourself a few weeks to place the animal in a good home, and never give away your pet to someone without screening the person carefully and asking for references. Please do not give your pet away “Free to a Good Home” as there are unscrupulous individuals who could harm your pet or sell the animal for research to make money. Asking a reasonable fee may help deter such people. 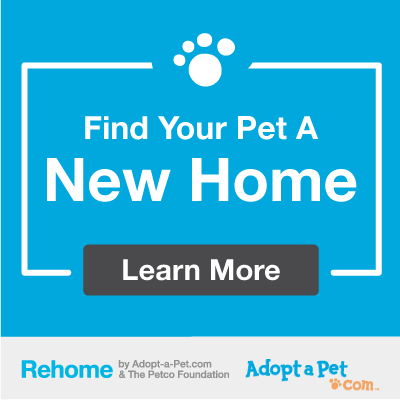 Michigan Humane Society has partnered with Adopt-a-Pet.com and the Petco Foundation to make the process of rehoming your pet easier. Our Rehome program will find a loving forever home for your pet. Click the banner below for more info. Making Your Pet as Adoptable as Possible: Unsterilized (intact) pets are at a much greater risk of being surrendered by their owners. This is due to related health or behavior (aggression, marking, roaming) reasons, or because they produce “unwanted” litters. By having your pet neutered or spayed, you may find you do not need to give him or her up. However, if you do still surrender your pet, ensuring he or she is sterilized will assist in the successful rehoming of the pet. MHS veterinary centers offer low sterilization fees. Ensuring your pet is current on vaccinations and has had proper dental care will not only help keep him or her healthier in a shelter environment or new home, but will also make him more appealing to a potential adopter. Groom or bathe your pet. Consider pet training which will make him or her more adoptable, and may even allow you to keep your pet. Also, having your pet at a healthy weight will make him or her more appealing to adopters. Have you found a stray animal? Stray animals need to be taken to the designated municipal animal control facility for the area in which the animal was found. This is necessary to ensure the best possible chance of the pet being reunited with its family, who may already be calling or visiting that shelter. The Michigan Humane Society is the contracted municipal animal control facility for the following cities/townships and can legally accept strays from these areas. Cities/townships not included on this list do not have a contract with MHS. MHS is no longer able to accept animals from residents who live outside these cities/townships. If you are not a resident in one of the MHS contract cities/townships listed above, but an animal is found in one of these cities/townships, authorization must be obtained from the city/township to leave the animal with MHS. Please call 866-Mhumane to ask for the location of the appropriate city.